Artist Andrew Novis with his work “Blue and Green Lovers Kissing,” which will be among the works featured during the annual Watertown Open Studios show on Nov. 16 and 17. 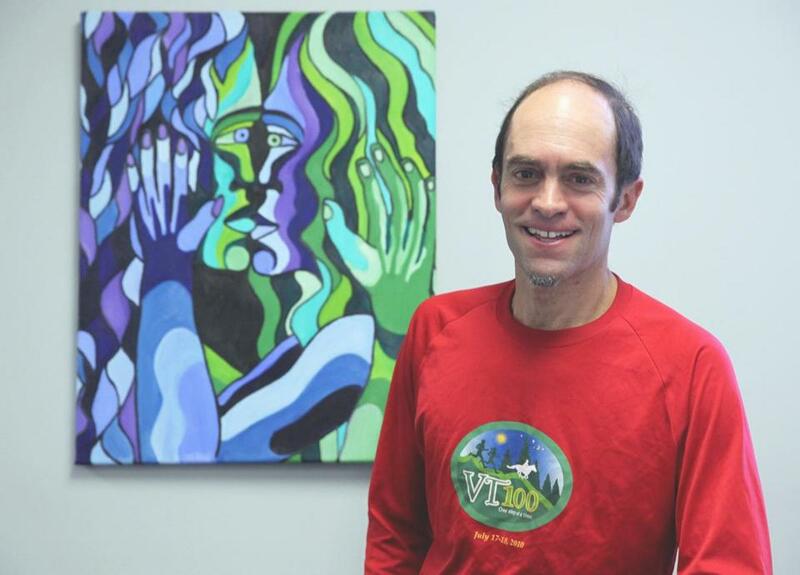 WATERTOWN — Andrew Novis has been painting bold, wavy, colorful works of expressionist art for long enough to fill his Medford apartment. Works by more than 30 artists like Novis, whose disorders give them distinctive perspectives, for the first time will be featured in the Watertown Open Studios weekend show, taking place this year Nov. 16-17. It will offer access to 100 artists at nine locations, and sale prices that don’t include a gallery’s commission, which can run as high as 50 percent. Though most of the artists will sell directly to buyers, those with Asperger’s will rely on the association’s gallery at 51 Water St. to handle sales. "Imagination" by Christopher Pereto will be featured during Open Studios weekend in Watertown. The association gallery held its first show, “Seeing With a Different Eye,” in June. But the Watertown Open Studios event marks a debut of sorts for the collaborative on the local arts scene. Visitors might be surprised, observers say, by the imagination and technical skills on display by its member artists, who sometimes feel they’ve landed on the wrong planet. 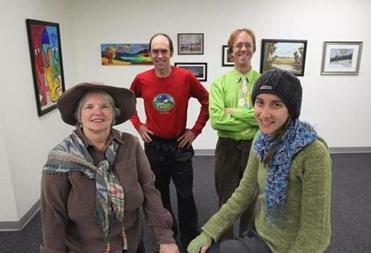 From left: Anastasia O'Melveny, Andrew Novis, Christopher Pereto and Karen Lean Boyd will have their art work shown at Asperger's Association of New England during Open Studios weekend in Watertown. People with Asperger’s say the condition brings heightened sensory awareness of environmental stimuli, such as sounds and energy, as well as experiences of mixed-up perceptions. For one example, Weymouth artist Christopher Pereto, 41, says he’ll see a painting and struggle to understand what sound it is making. Working on a canvas, the artist with Asperger’s feels in control and finds relief from anxiety. He or she is free to explore fantasy and shape worlds without regard for social norms or hard-to-understand societal codes, according to artists in the collaborative and association staff facilitators. Several in the collaborative say they’re drawn to depict animals and fantasy scenes. 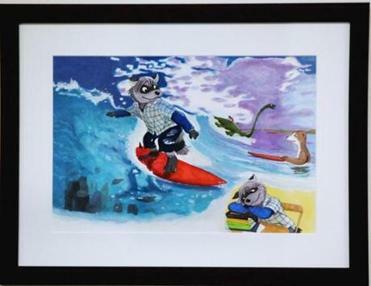 Pereto makes anthropomorphic, cartoon-like images of animals doing playful things like surfing. So acute are sensory experiences for those with Asperger’s that they can be overwhelming. As Karen Lean Boyd, 36, of Medford, took a reporter around the gallery, she twice moved out of earshot of people who were talking because “I’m sensitive to energy,” she said, and she gets distracted by voices. She showed one piece that took 10 years to complete; she simply kept working on it until she felt it was finished. "Little Sheltered" by Karen Lean Boyd. The collaborative, whose members range in age from 19 to 66, meets monthly in Watertown. Participants share insights, such as how to price or market art, and fellowship. The group builds on a foundation laid by a few parents, whose artistically talented adult children needed help showing their work. Parents who had been putting together art shows for their children since 2007 went on to establish the collaborative in 2011. “We had a discussion that maybe it’s time to really get a group together to get the artists more involved” in finding opportunities and putting shows together, said Jamie Freed, director of adult services at the Asperger’s association. This isn’t the first time artists with disabilities have found a showcase at the Watertown Open Studios. 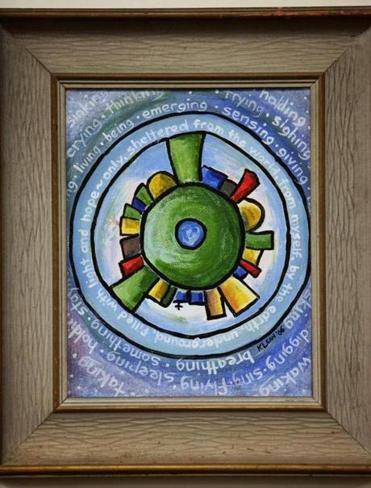 The annual Able Arts group show will feature works by more than 15 disabled artists at Watertown Free Public Library, 123 Main St . ARTrelief, an art-therapy center at 815 Mt. Auburn St., will display pieces by artists who face a variety of challenges, such as coping with chronic illness. Providing direct access to such artists and their work helps educate the public about more than art, according to Laura Segal, chairwoman of the town’s Cultural Council . Artists hope the event helps catapult their careers. Pereto and Novis aspire to make a living as artists; their day jobs are bagging groceries and maintaining lawns, respectively. The collaborative’s members also hope to do some selling, with works priced from $55 to $1,500, and many below $250. Extra money from sales would help personal budgets, of course, but the bigger reason is validation. At the Asperger’s association show this spring, collaborative member Anastasia O’Melveny sold her first photograph in a gallery. The $115 she got represented something much more valuable to her. G. Jeffrey MacDonald can be reached at g.jeffrey.macdonald@gmail.com.